As a young boy Magnus Carlsen was very different from his peers. He usually sat by himself, lost in thought, and his parents, Henrik and Sigrun, were concerned about his relative development. When a strong interest in numbers made them realize that he could become a good chess player, they introduced him to the game at the tender age of 5. He soon started climbing the ranks of the chess world. At 13 he became the youngest grandmaster in the world, and began to wonder just how far he could go. Magnus’ father was told that the road to success in chess is paved with hard discipline and structure, but he refused to force Magnus into rigid modes of learning. Instead the family let him keep his playfulness, and nurtured his curiosity and fascination for the game. This approach, in time, strengthens Magnus’ best overall trait as a chess player: his brilliant intuition. Magnus is the incredible story of a boy, who went from being bullied by his classmates to become the World Chess Champion. 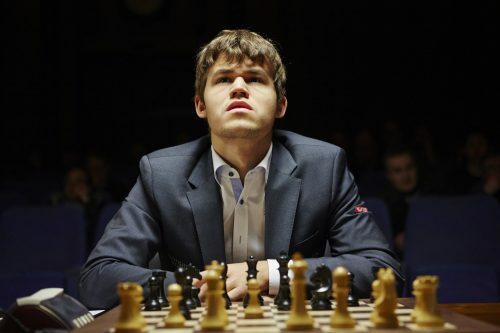 For a decade the filmmakers have captured the decisive moments of Magnus Carlsen’s life, one of the world’s most intelligent people, and achieved over 500 hours of footage. In 2004, when Magnus was 13 years old he made a decision: He would become the World Chess Champion. The coming of age story unfolds as we follow the prodigy battling his way through the ranks of chess, with personal sacrifices, special friendships and a caring family. MAGNUS is a character driven drama that is bound to engage the non-chess players, as well as the over 600 million people who play chess all over the world. Born in Tønsberg, Norway on November 30th, 1990 it wasn’t before long that he began to learn the game of chess. Although he began learning chess around the age of 5, he didn’t begin to show much interest until he saw his older sister playing well. After achieving his goal of defeating his sister and then father, his enthusiasm for chess grew. He became an International Grandmaster at the age of 13, the youngest at the time, and the third youngest in history. At the age of 19, he became the youngest ever chess player to be ranked World Number One. Since July 2011, he has been the highest rated chess player in the world. In January 2013, hebroke Garry Kasparov’s record by ten points achieving the highest rating ever with 2862. He increased his own record by 10 points, making 2872 and then to 2882, the highest chess rating in history. 6 months before he won the World Championship, In April 2013, he was added on the TIME 100-list, as one of the most influential persons in the world. 22-year-old Magnus became the World Chess Champion in November 2013, defeating Viswanathan Anand in Chennai, India. He successfully defended his title in November 2014, once again defeating Viswanathan Anand.